The Lexus badge might look familiar but the dramatic creation is all new; it’s Skyjet, a specialized single seat military-type vehicle like no other. This awesome innovation was built for the forthcoming Valerian movie and features a design that was produced from an original sketch by Ben Mauro. Mauro was the concept designer for the film and the machine gets a firm nod from nature, notably dolphins, whales and sharks, with their smooth and aerodynamic body lines. Man-made objects have also played a big part in the design of Skyjet, with fighter jets, luxury single seat submersibles and all manner of aquatic and flying vehicles also providing a whiff of inspiration. Of course, bearing in mind that there’s no atmosphere in space, the Skyjet doesn’t need wings per se, but it does need to be adaptable to different atmospheres and gravity. Therefore, Skyjet has been designed to be supremely aerodynamic with a shape that can cut through the toughest environments in the universe. Of course, Skyjet is really just a prop from Luc Besson’s science-fiction epic Valerian, but the level of detail present in this machine is awesome. In fact, get up close to it and it’s hard not to want to hop in and take the thing for a spin, flight or whatever you would call a journey in this dart-like creation. Unfortunately, it doesn’t actually fly, but aside from that minor point everything else is present and correct. Lexus came on board the project with a brief that involved producing a single-seat pursuit craft belonging to the word of Valerian, set some 700 years in the future. Along the way, the production team captured the Skyjet’s development story, so it’s now possible to see how the design evolved from an initial brief through to a finished product. There are insights from Luc Besson and Dane DeHaan, the actor who takes the lead role of Valerian. There are also interviews with others involved, including Lexis Chief Engineer, Takeaki Kato. “Technology will constantly advance and it’s impossible to be certain now of things that are far in the distant future. However, at Lexus, we constantly challenge ourselves to imagine them,” he said of the project. The outcome of this design and innovation collaboration has produced a Skyjet that looks both eye-catching and believable. There are quirky touches too, with that distinctive Lexus spindle grille and logo being the most obvious nod to the auto industry. Meanwhile, underneath those elegant curves, the Skyjet is said to get its propulsion from an imagined energy capsule of the future. It’s not a million miles away, perhaps, from Lexus’s current development work involving hydrogen fuel cell technology. Skyjet would be made from an advanced military-grade metal material, which could fend off all manner of attacks. Added to that, it would boast a top speed and altitude limit that would dwarf that found on most modern day jet fighters. The Skyjet has features that would make it hugely practical too, such as a fully functional retractable glass cockpit, which could be operated by voice or touch. There’s also a harpoon fitted to the front of the craft, while airbrakes at the rear allow the Skyjet to harpoon another craft and slow it down almost instantly. 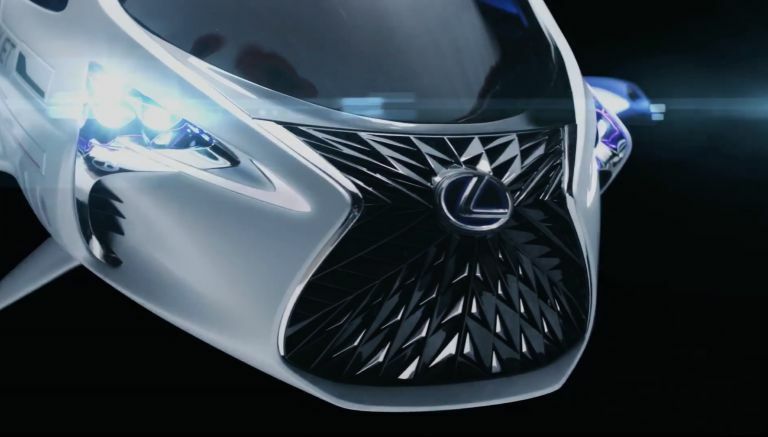 Topping things off are the additional styling flourishes, including that grille, which incidentally is similar to the Lexus LF-SA Concept car. Headlights have been inspired by the three projector LED lamps as seen on the Lexus LC 500. You’ll also notice that very obvious fuel cell system, which is effectively a small cartridge that, says the designers, could be charged at home. As for the fuel itself, those behind the concept reckon that in the future a fuel could utilize tachyon particles or anti-matter from black holes, which takes it to another level compared to current hydrogen fuel development. This bold project took about five months from conception through to completion, which is pretty quick for something built almost entirely from scratch. The development took place at the advanced European Design Centre in Nice, France, and the model itself was constructed in Paris. The design process for the Skyjet was very similar to that of designing a new car, but as there wasn’t time to build a full-scale clay model, the overall production schedule was reduced by around 50 percent when compared to the typical Lexus new vehicle design project.